EMV Chip cards increase the security of your Mastercard. EMV technology is now used in all of our Mastercards. EMV chip technology makes an already secure card even safer. We’re pleased to introduce the added security of chip technology to your Mastercard® credit card. Chip cards have a microchip embedded in the card that provides increased protection against fraud. Your chip card comes with technology that is already in use around the world, and has been proven to reduce counterfeit fraud.Shop with confidence—at home and around the world—knowing that the chip in your card can help protect you from fraud while opening up the world for you. Your Mastercard® credit card has chip, contactless, and magnetic stripe technology. That means, regardless of what type of terminal a merchant has, you’ll be able to use your card anywhere Mastercard® is accepted. 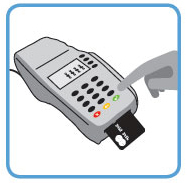 How Do I Use My Chip Card at Chip-Enabled Terminals? Insert your card "chip first" into the chip-enabled terminal. You may be required to enter your PIN or sign to complete the transaction. What is a Chip Credit Card? 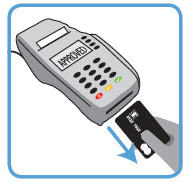 Chip cards — or "smart cards” — have a microchip embedded in the credit card. The chip is encrypted and provides stronger security and protection against fraud. What is different from my current Credit Card? 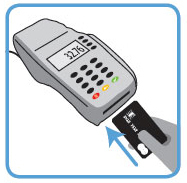 The EMV ‘chip’ card will be inserted vertically into the payment terminal and you may be prompted to enter a PIN (personal identification number). This is similar to how a debit card prompts for a PIN at the payment terminal. The merchant will decide if you need to enter a PIN or you will sign for your purchase as you are accustomed to. Why are EMV credit cards and EMV payment transactions more secure? EMV cards store payment information in a secure chip rather than on a magnetic strip, and the personalization of EMV cards is done using issuer-specific keys. Unlike a magnetic strip card, it is virtually impossible to create a counterfeit EMV card that can be used to conduct an EMV payment transaction successfully. EMV secures the payment transaction with enhanced functionality in card authentication, cardholder verification, and transaction authorization. The biggest benefit of EMV chip cards lies in its powerful fraud prevention technology inherent in the chip. Because every EMV card is essentially a small, secure computer, EMV cards are nearly impossible to counterfeit. By replacing the current unencrypted magnetic strip with a chip embedded in the card, smartcard technology adds dynamic data to the transaction process, making it far less vulnerable to fraudsters. EMV has been implemented in more than 80 countries around the world, with approximately 1.5 billion EMV cards issued globally and 21.9 million POS terminals accepting EMV cards at the end of 2011. The U.S. payments infrastructure is now moving to EMV adoption with approximately 70 percent of credit cards and 40 percent of debit cards in the U.S. --1.1 billion cards total that will support EMV by the end of 2015. The United States is one of the last countries to migrate to EMV with 59 percent of US retail locations supporting EMV by the end of 2015. Will magnetic strips be discontinued on credit cards? No, magnetic strips will continue to be used on cards so they can be used at terminals in countries that have not yet converted to chip technology, including terminals that are currently not upgraded in the United States.